Hardwood is both functional and beautiful, working well in most household rooms, especially living rooms, dining rooms, and bedrooms. By reflecting each family’s lifestyle, wood floors create a backdrop that can blend into any style of décor or design. Engineered flooring should not be confused with laminate wood flooring. Engineered flooring is composed of adhering layers of wood in the form of a plank. The top layer (real wood) is fused with a plastic laminate veneer, which provides stability. The key difference between Atlantic Flooring’s engineered wood and laminate flooring is that laminate flooring contains no actual wood. methods from the Industrial Revolution, exotic wood flooring manufacturers have opened up a new world of flooring choices, offering greater latitude to express personal statements in design and décor. Bamboo, cork, and other exotic woods are quickly advancing from an alternative flooring choice to the primary one. ● Cork is a soft, quiet choice that has become popular for playrooms, kitchens, and bathrooms. Made from the cork of an oak tree, cork flooring is highly resilient and perfect for areas that demand non-slip surfaces. 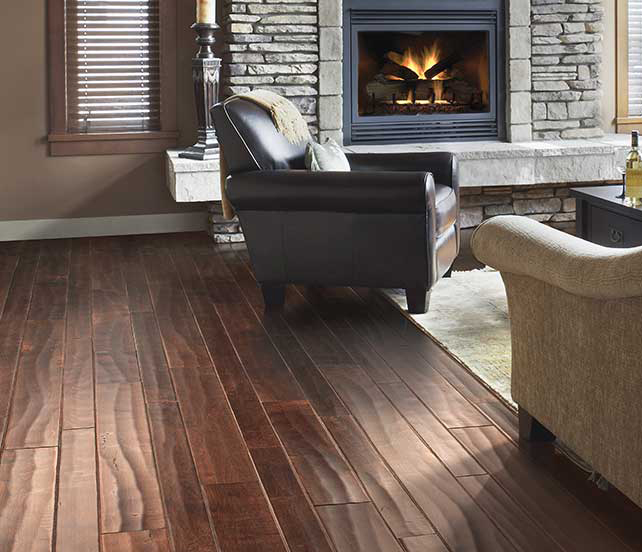 Our wood flooring selection offers durability and sophisticated aesthetics that you can proudly show off to guests, while living comfortably day after day. Rumson, Colts Neck, Spring Lake, Manasquan, Little Silver, Asbury Park, Manalapan, Marlboro, Eatontown, Matawan, Middletown, Howell, Jackson, Freehold and Holmdel.